Opened 1960 as "Cleary Auditorium and Memorial Convention Hall". Later rebuildings that led to today's "St. Clair College Centre for the Arts" with its "Chrysler Theatre". 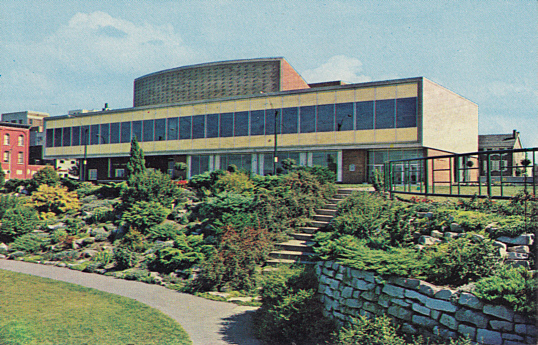 Reverse Text: "Cleary Auditorium and Memorial Convention Hall, Windsor, Ontario, Canada. Canada's International Convention Centre, erected to the memory of the late Francis Cleary, and in grateful tribute to those men and women of the Windsor area who gave their lives in World War I, World War II, and the Korean War.""